While many companies focus on reducing their own costs, we strive to be different. West Michigan Compounding produces profitable solutions that benefit both your business, as well as ours. 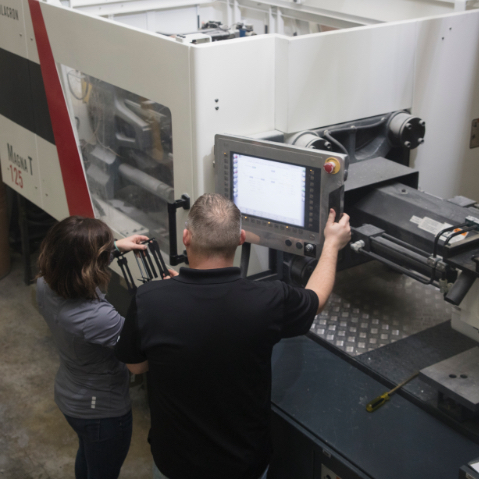 Through our reclamation process, expertise in formulation, and state of the art extrusion equipment, we can maximize the physical properties of every material, yet minimize the cost to your business. Bring us your challenges and see how we can turn them into opportunities. Our customers rely on us because our plastic scrap reclamation process is one of the most comprehensive in the industry. At our facility, we possess all the necessary equipment to reclaim your plastic scrap and transform it into a viable product. Our team will visit you on-site and work alongside your production group to identify salvageable plastic scrap. We then implement programs to collect and transport the scrap to our reclamation facility, so it can be converted into new, usable products. As experienced sorting experts, our team is highly skilled in plastic identification. While this process is generally manual and time-consuming, we are able to quickly differentiate and segregate materials for further processing. 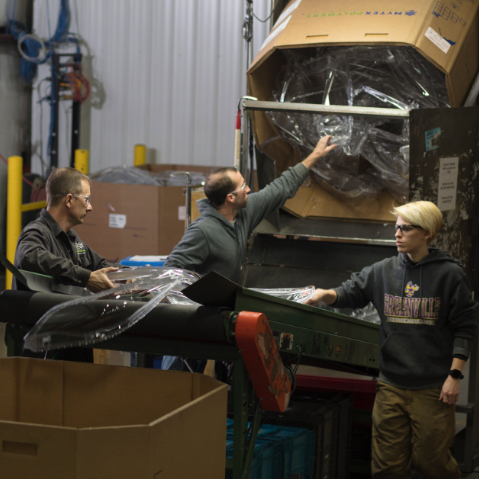 During this time, our sorting group disassembles or detaches non-similar plastics, metal clips, and more. Contact us to see if we can assist you in sorting and reprocessing a particular product. 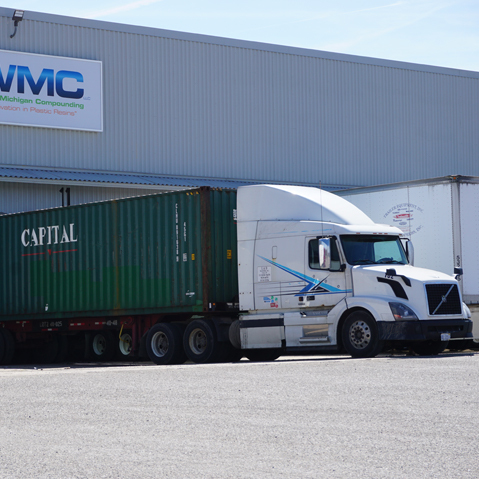 With trading partners around the world, our export business is both extensive and efficient. By dealing directly with actual processors in these markets, we can fulfill all your needs for unsortable plastic scrap. Our capabilities and experience in exporting guarantees each transaction runs smoothly. For any plastic products that are difficult to recycle, this process is an ideal opportunity to avoid using a landfill and profit from your supplemental scrap. To discuss exporting in further detail, please contact us today. If you are an importer, view the Mixed Parts & Runners PDF to see examples of common products we export. 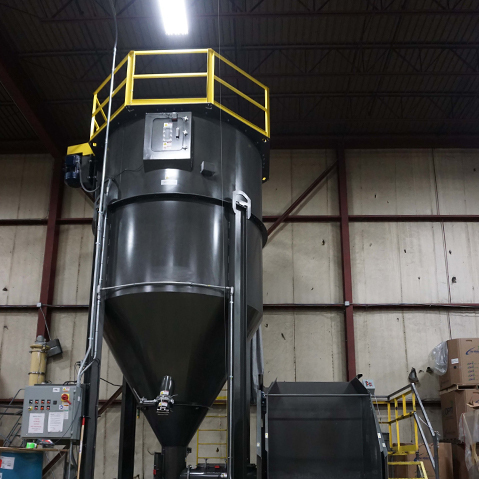 At West Michigan Compounding, our in-house size reduction technologies for shredding and grinding are unrivaled. We have an experienced team that continuously monitors the grinding process to ensure no contamination enters the system. Familiar with every type of material, our team handles both large and small parts. And depending on the situation, we can segregate parts by color, then re-integrate them back into your process. 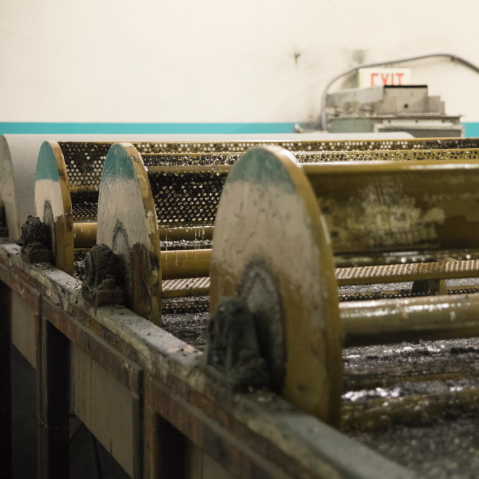 Our facilities hold two wash lines, which can separate dissimilar materials using a sink/float process. This is performed after determining the specific gravities of the materials to be separated versus the solution in the tank. The specific gravity of the solution in our tanks may be modified depending on the materials to be separated. These materials are conveyed through the tanks, then sent through centrifugal and/or desiccant dryers. Highly skilled in plastic resin formulations, West Michigan Compounding designs custom compounds to meet any specifications. We work with you to select the right material and formulate an optimal product to serve your application. Our compounding equipment allows us to add fillers, such as glass, mineral, talc or calcium carbonate to increase the stiffness of your final product. Additionally, if ductility is an important requirement, we can offer impact modification for all types of plastic resin. 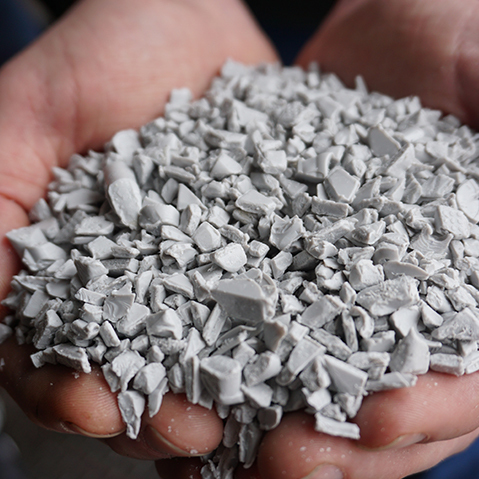 We also work with recycled materials in formulations—minimizing the cost of your end product. With proper formulation, this difference is unnoticeable when comparing the physical property reduction versus virgin resins. 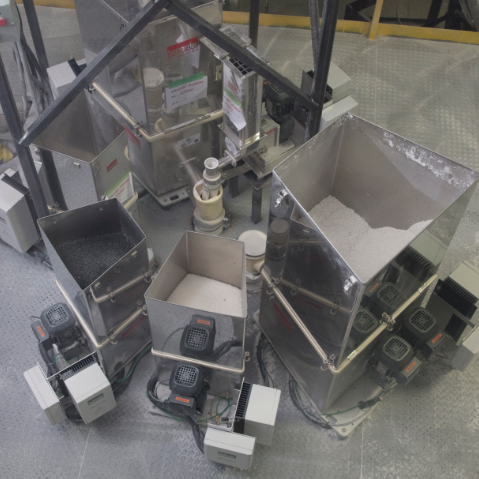 To certify a homogeneous final product, our team uses large-scale blenders to mix up to 40,000 pounds. We also use large capacity vertical auger blenders and horizontal ribbon blenders. When developing compounds from recycled feedstocks, the blending process is critical to ensure homogenous blends for formulating. At this stage, our product will achieve the lot-to-lot consistency, so your process is repeatable. Twin screw extruders are used to produce our custom compounded virgin and recycled products. 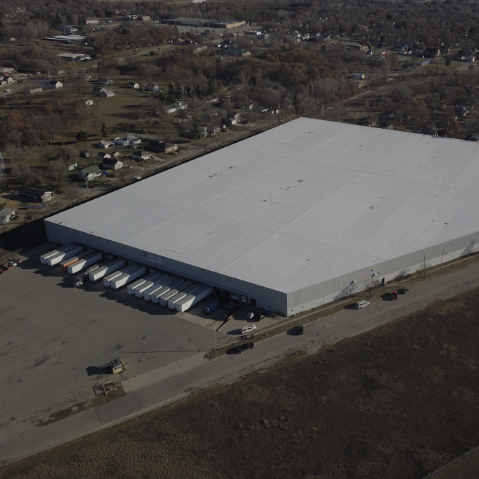 West Michigan Compounding allows you to select from a diverse product portfolio, depending on the physical properties you require. 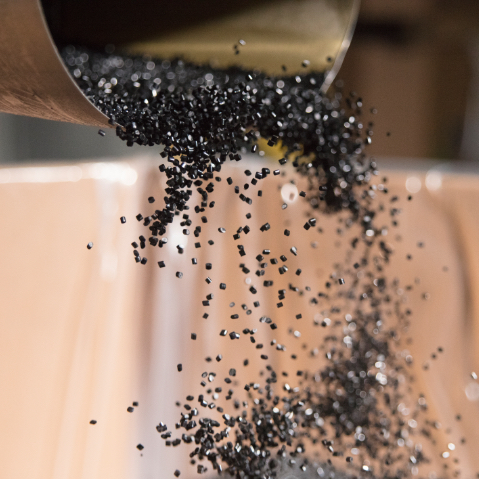 Our extrusion lines use both underwater and strand cut pelletizing, in addition to using loss-in-weight feeders on each compounding line, to add appropriate levels of fillers, additives, and colors. The in-house plastics lab at West Michigan Compounding provides a full range of polymer testing. Our lab continuously monitors products to ensure they meet set standards or requirements. We certify each lot of material produced to guarantee the physical properties are consistent and within our customers’ specifications. Our capabilities in lab testing and certification include: melt flow, notched izod impact, tensile and flexural testing, ash analysis for fillers, specific gravity, heat deflection testing (HDT), vicat, FTIR, DSC, gardner impact, hardness, moisture levels, and color measurements.